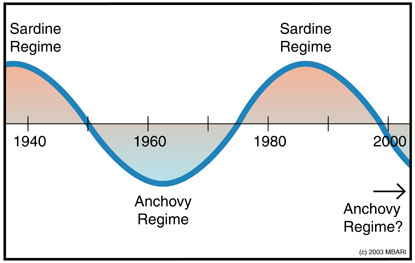 This highly simplified graph shows how the Pacific Ocean has alternated between “sardine regime” and “anchovy regime” over the past 70 years. MOSS LANDING, California—In the late 1930s, California’s sardines supported the biggest fishery in the western hemisphere, with more than half a million tons of fish caught each year. By the mid-1950s, the sardines had virtually disappeared. Although fishing pressure may have played a part in this process, new research published in the current issue of Science indicates that the sardines’ demise was part of a 50-year cycle that affects not just California, but the entire Pacific Ocean. To this end, Chavez gathered data from fellow scientists, not just on fisheries biology, but on sea-surface temperature, elevation, currents, atmospheric carbon dioxide concentrations and circulation, global air temperature, and more. Despite considerable year-to-year variability, Chavez found parallel trends across the entire Pacific when he looked at three-year averages and subtracted out gradual long-term increases (such as that of carbon dioxide). These trends show that sardine and anchovy regimes alternate about every twenty five years, and that the most recent shift (from sardines to anchovies) occurred in the late 1990’s. 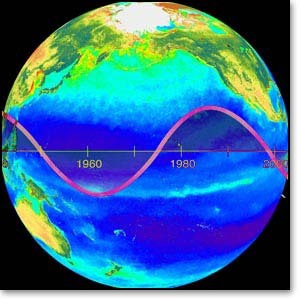 These cycles are similar to the familiar El Niño and La Niña events, but take place over longer time periods and have greater effects at mid- and high latitudes. For example, average conditions during a sardine regime are analogous to those during an El Niño event, when coastal waters off of Peru and California become warmer than usual. Less nutrient-rich deep water is brought the surface, so phytoplankton populations remain relatively low. This affects the entire marine food web, resulting in fewer zooplankton, anchovies, seabirds, and even salmon and rockfish. In contrast, the waters off Japan and the north-central Pacific respond oppositely, with increased productivity. 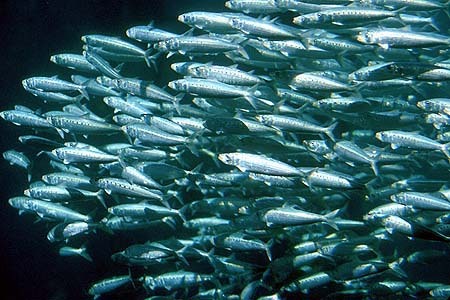 Surprisingly, sardines tend to be more common on both sides of the north Pacific during these periods. During an anchovy regime, all of these trends are reversed. This highly simplified graph shows how the Pacific Ocean has alternated between “sardine regime” and “anchovy regime” over the past 70 years. These two regimes involve not just fish, but changes to ocean currents and the atmosphere across the entire Pacific Ocean. Chavez hopes that by studying these long-term cycles, scientists will be able to better understand the effects of human activities. A prime example is the demise of the sardines. Chavez comments, “At least for these fast-growing fish, commercial fisheries are not always the sole cause of the collapse.” Similarly, he points out that studies of global warming based on data collected over several decades could be strongly influenced by these natural, multi-decadal oscillations.